I'm back with another card created with the Kitschy Kitchen card kit. This is such a fun set to play with! For this card, I stamped all the images in Black Licorice Hybrid Ink. I coloured them in with Copic colors that matched the card stock in the kit, Daffodil, Ripe Raspberry, Gumdrop Green, and Summer Splash. Under our printable resources tab on the blog we have a printout for all the Copic Colour matches. I LOVE having this resource, it makes picking colours a breeze! 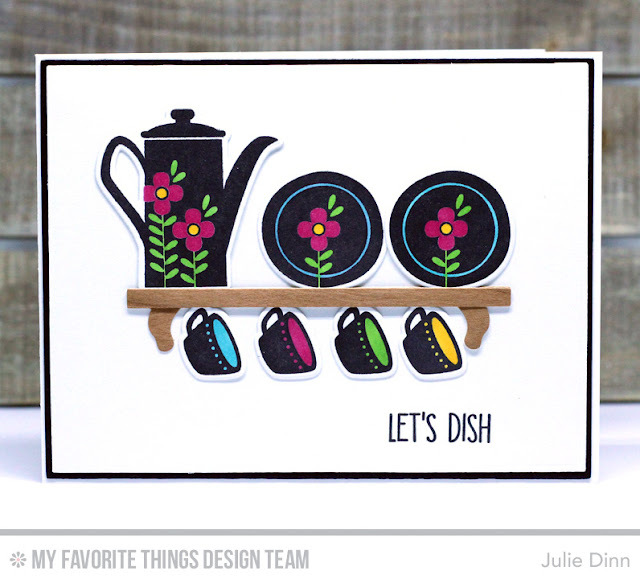 Don't forget the Kitschy Kitchen card kit will be available on Tuesday, November 15 at 10:00pm EST. What a fun look and a great invitation to get together with a friend. Super! What a beautiful display of dishes! Julie--Your card is sooo pretty! I love it! Love the colors! Can't wait to get my hands on this kit! Wow - this is just gorgeous! I love how the colors pop against the black and then stand out on the white background! Nice job!! Classy and stylish! Beautifully done! Such a cute card, love the black accents! ! Absolutely love this card! Such a clever idea!